Orlando sets out its claim to be a world-class tech hub. One sector that is set to continue to thrive with support from governments and industry is the tech industry. From Silicon Valley to Silicon roundabout, to Berlin to Stockholm, cities worldwide are attracting talent and growing exciting tech hubs. With a longstanding history in space exploration and innovation, Orlando in Florida is well established as a leading tech hub – putting the state on the map for businesses that are looking to re-locate or expand their business internationally. Florida is the fourth largest economy in the US and the ‘sunshine state’ (as many like to call it) has a highly skilled and diverse workforce of nearly 10 million people, state-of-the-art infrastructure and unmatched global access. Of this workforce, more than 310,000 are ‘high-tech’ employees and 28,000 new STEM graduates start work every year. Florida has had tremendous success attracting and retaining IT companies in the recent years thanks to the mix of business climate advantages and industry assets. An appealing quality of life, reliable infrastructure, low taxes, and unique multilingual workforce are among the many other qualities that help businesses thrive as well as attract the 27,000 IT establishments, employing over 237,000 IT professionals. Today, Florida boasts the nation’s third largest tech industry. The state’s IT strengths are wide ranging – from software to photonics to modeling, simulation and training. With the third most fibre miles among states (61,000+), the third most fibre lit buildings (over 47,000 total fibre lit structures), the most submarine fiber landings in the continental US, and the fourth most data center locations (275 total), Florida is a prime strategic destination for technology companies due to its location and strong cable connections. Central Florida, in the heart of the sunshine state, has a longstanding history in space exploration and innovation and is making full use of its talent pool to maintain its position on the world stage. 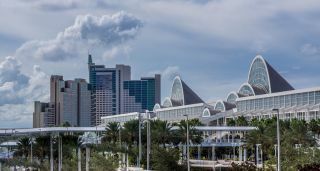 Orlando specifically is well-established as a leading tech hub – putting the state firmly on the map for businesses that are looking to re-locate or expand their business internationally. Orlando is known the world over as a vacation hotspot with Disney World, Universal Studios, and The Wizarding World of Harry Potter delighting visitors from across the globe. If you couple this with the region’s strong military and space exploration tradition, you can see why Orlando is called the ‘simulation capital of the world’. Orlando is about much more than just its theme parks. The city employs thousands of software developers, computer programmers, graphic designers and engineers. It’s increasingly establishing itself as a high tech leader, attracting companies seeking a tech/start-up hub of innovation and it’s staking a claim as a tech hub. A booming tech community has emerged as a result of many multinationals having an outpost in the city as well as a motivated workforce attracted by the many lifestyle advantages that Orlando has to offer. Co-working spaces have seen a huge wave of demand driven primarily by the emergence of this successful tech community. New spaces in the city such as Catalyst and the planned Creative Village reflect the continued popularity of more collaborative ways of working. Creative Village will help Orlando compete globally by creating a 68 acre mixed use, transit-oriented, urban infill neighbourhood in the heart of downtown Orlando. Add to this, Downtown Orlando’s historic Church Street Station, which is now home to more than 70 tech-related companies and Orlando’s start-up offer is very attractive to UK businesses looking for an alternative outside Europe. Last summer, Imec, a Belgian nanotechnology company, agreed to create Imec Florida, a research and development design centre that will focus on photonics and high-speed electronics. Imec will be located in the new smart sensor consortium called BRIDG (Bridging the Innovation Development Gap) – the only advanced materials manufacturing development centre focused on the integration of semiconductor-based processes and materials into future products such as smart sensor and photonics devices. The US National Centre for Simulation (NCS) is headquartered in Orlando and is at the epicentre of the modelling, simulation and training industry. The centre is a major contributor to the overall security of the United States, involved in everything from military readiness to space exploration to healthcare and transportation. The NCS is also part of the ‘Team Orlando’ partnership between military organizations, the modelling and simulation industry and academic institutions. One member of the NCS is DiSTI, a graphical software company which creates 3D virtual environments for training in the aerospace, automotive, medical, and training industries and boasts Jaguar Land Rover and Boeing as some of its clients. Florida is committed to keeping regulatory requirements and business taxes low. That, along with a strong economy and zero personal state income tax, makes it a great place to do business. It’s true that Florida is the sunshine state, but Florida is also the place where IT, space, military and entertainment technology converge with start-up innovation. And the city of Orlando is increasingly competing with cities across North America to foster talent and new ideas in the technology sector. The state is encouraging the success of new and exciting tech companies, helping further Orlando’s economy and gain further recognition from around the world as a city of innovation. Dozens of British businesses have set up in Florida attracted by everything the state has to offer. For businesses in the UK, Florida might be the business location they hadn’t even thought of. As the world shapes itself following a year of huge changes experienced globally, it will be those businesses that can spot opportunities in new and previously unconsidered markets that will be in the best position to profit in 2017.